Greeley, PA – Kahr Arms is proud to announce their title sponsorship of the Kahr Arms Defensive Challenge & Demo Day. The event will take place October 14th and 15th at the Peacemaker National Training Center in Glengary, WV. The event is an inexpensive and unique opportunity for participants to competitively shoot pistols and pistol carbines in a variety of simulated defensive situations without the confines of an overly complex set of rules or regulations. Over two days, the match will include 6 divisions and 8-stages, each with various scenarios. The stages will replicate IDPA, will be shot on IDPA targets, but without the restrictive IDPA cover and limiting rules. Each of the 6 divisions will include challenges utilizing movement, distance, position, and concealment. Each stage will only require 16-rounds properly placed in paper or steel to complete, however, the maximum rounds fired are not limited. Among the stages are: PCC, using any caliber carbine chambered in .380, 9mm, .38, .357, .40, and .45 calibers. Open which requires any handgun with any or all of the following; optics, compensator, or a magazine greater than 140mm. Limited is for any handgun with double stack magazine up to 140mm and iron sights. The Single Stack is for any handgun with single stack magazine and iron sights. Compact Carry is for any handgun with double stack magazine and a barrel length 4-inches or shorter. Lastly, Sub-Compact Carry is for any handgun with single stack magazine and a barrel length 4-inches or shorter with 10-round or less magazine capacity. A minimum of 128-rounds in total will be required for the match. Participants will need to provide their own firearms and ammunition. Participants will have the added opportunity of trying out a variety of Kahr Firearms Group guns, including: Desert Eagle .50 caliber, Tommy Gun, M1 Carbine. Baby Desert Eagle, 1911s and also a variety of Kahr Arms concealment and carry handguns. Kahr has donated 7 firearms from the Kahr Firearms Group product line as prizes. If a participant completes every stage of the match, they qualify for the prize table. Peacemaker National Training Center just announced that they have lowered the entry fee to $25.00 for the two-day event. Greeley, PA – Kahr, the leader in technology and innovation, is sponsoring a “Barrel Envy” YouTube video contest which began September 1, 2017 and runs through December 31, 2017. The grand prize has a retail value of $10,000 in Kahr Firearms Group products to include: Kahr, Magnum Research, Thompson, and Auto-Ordnance. To enter, contestants must submit a video no shorter than 30-seconds and no longer than 5 minutes demonstrating why they prefer a Kahr Arms pistol over a competing brand semi-auto pistol. Any Kahr Arms product may be used. Contestants then submit the URL link to Kahr.com. The videos will be reviewed by a panel of Kahr Firearms Group judges and the winner will be announced in January 2018. This is the first time that Kahr Arms has offered a $10,000 prize value. To be considered, the judges will be looking for quality of video, good presentation, and creativity. The video must include a Kahr Arms pistol vs. a competing brand semi-auto pistol. 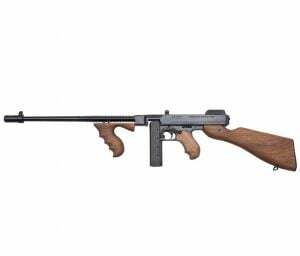 The Thompson 9mm model T5-9L20 features all the classic details that John Thompson so meticulously put into the original. The frame and receiver are machined from a solid billet of aluminum and the buttstock, grip and vertical fore grip are all made from American Walnut. The 9mm is offered with one 20-round stick. The finned barrel measures 16.5 inches and 18 inches with the compensator. Overall length is 41 inches. It features a front blade sight and an open rear adjustable. The MSRP is $1,364. Greeley, PA – Kahr Firearms Group is proud to announce that they are Silver Level Sponsors on the 2017 NRA World Shooting Championship. The event takes place September 14 – 16, 2017 at the Peacemaker National Training Center in Glengary, West Virginia. The Championship brings both amateurs and professional shooting enthusiasts together to compete in 12 challenging stages. Each of the 12 Stages requires skills in using various types of firearms including; pistol, rifle, and shotgun. In the end, one winner will be honored with the title of “World Shooting Champion”. Competing for the title, while also representing Kahr Firearms Group, is Joby Goerges, Director of Manufacturing & Engineering, Magnum Research. This is the first time that Goerges has competed in this challenge. Also competing for the title will be John “Tig” Tiegen, pro-staff for Kahr Firearms Group. Tiegen is most noted for his heroic role in the terrorist attack on September 11, 2012 when Islamic militants attacked the American diplomatic compound in Benghazi, Libya which killed four Americans. Tiegen is also co-author of 13 Hours: The Inside Account of What Really Happened in Benghazi and was a consultant on the movie 13 Hours: The Secret Soldiers of Benghazi. Tiegen has also received the Award for Heroism and Valor in recognition of his bravery. Greeley, PA – If you are attending the 146th NRA Annual Meeting and Exhibits in Atlanta, Georgia April 27-30, save the date of Saturday, April 29th to meet John “Tig” Tiegen in the Kahr Firearms Group booth. “Tig” will be in the booth from 2:00-4:00 that day signing his book: 13 Hours: The Inside Account of What Really Happened in Benghazi. Tiegen, a former Marine Sergeant, Infantry Squad Leader, and an Annex Security Team member for CIA’s GRS (Global Response Staff) is most noted for his heroic role in the terrorist attack on September 11, 2012 when Islamic militants attacked the American diplomatic compound in Benghazi, Libya which killed four Americans. John has also received the Award for Heroism and Valor in recognition of his bravery. 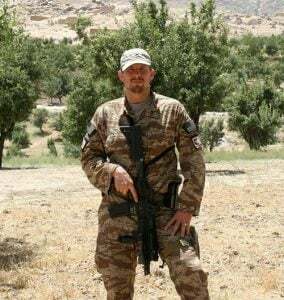 Stop by the Kahr Firearms Group booth, number 3832, and meet John “Tig” Tiegen in person to shake his hand and thank him for his service. The NRA Annual Meeting, which brings together over 80,000 attendees and has over 800 exhibitors, is the largest NRA hosted event of the year. It is being held at the Georgia World Congress Center. Greeley, PA – Kahr Firearms Group is proud to announce a sponsorship agreement with John ‘Tig’ Tiegen. As a sponsor of Kahr Firearms Group, Tiegen will serve as a representative of the brands to include: Kahr Arms, Magnum Research and Auto-Ordnance and will participate in promotional appearances, shooting events, and for demonstration and instruction in firearm classes. Tiegen, a former Marine Sergeant, Infantry Squad Leader, and an Annex Security Team member for CIA’s GRS (Global Response Staff) he is most noted for his heroic role in the terrorist attack on September 11, 2012 when Islamic militants attacked the American diplomatic compound in Benghazi, Libya which killed four Americans. Tig is also co-author of 13 Hours: The Inside Account of What Really Happened in Benghazi and was a consultant of the movie 13 Hours: The Secret Soldiers of Benghazi. John has also received the Award for Heroism and Valor in recognition of his bravery. Stop by the Kahr Firearms Group booth and meet John ‘Tig’ Tiegen in person at the USCCA Concealed Carry Expo to be held April 7-9 at the Fort Worth Convention Center in Fort Worth, TX.